Ridgewood wasn’t on our radar when we were house hunting in Bergen County. But we stopped there for lunch, and I bought a copy of the local weekly newspaper to peruse the real estate section. On the front page, a photo of the high school graduation procession caught my eye: girls in long white gowns, each carrying a dozen red roses, accompanied by boys in white dinner jackets with red boutonnières. We didn’t have children yet—but I instantly knew I wanted to live in this town. Or rather, the Village of Ridgewood, its incorporated status. With almost 25,000 residents, it’s not really a tiny hamlet. But it’s loaded with charm: front-porch homes on streets with old-growth tree canopies; a massive Fourth of July parade where folks set up chairs along the route a week before; Graydon Pool, a natural swimming hole; and a picturesque high school...where our daughters ultimately posed in white gowns, holding roses. Like many suburban downtowns in New Jersey, Ridgewood once suffered from mall competition. 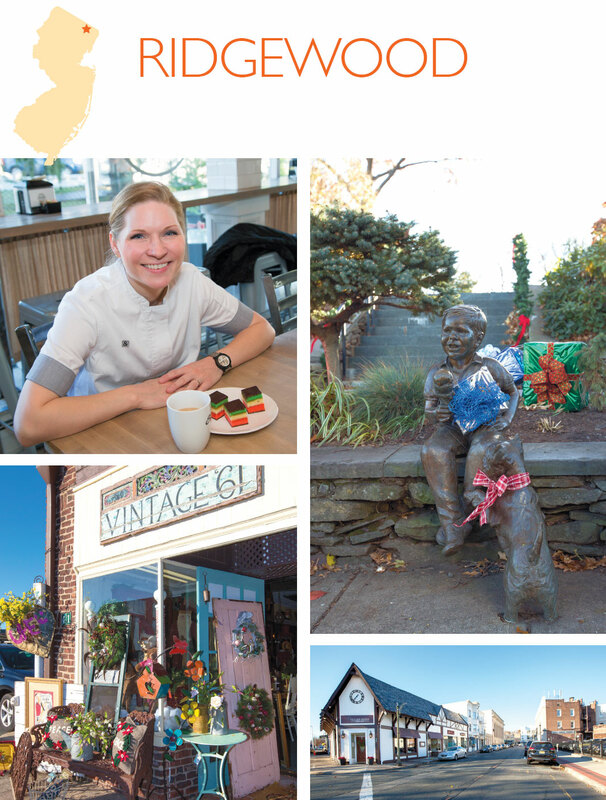 In the past two decades, families have moved to Ridgewood for its excellent school system and reliable commuter trains, and the village’s shopping district is again a busy community hub. 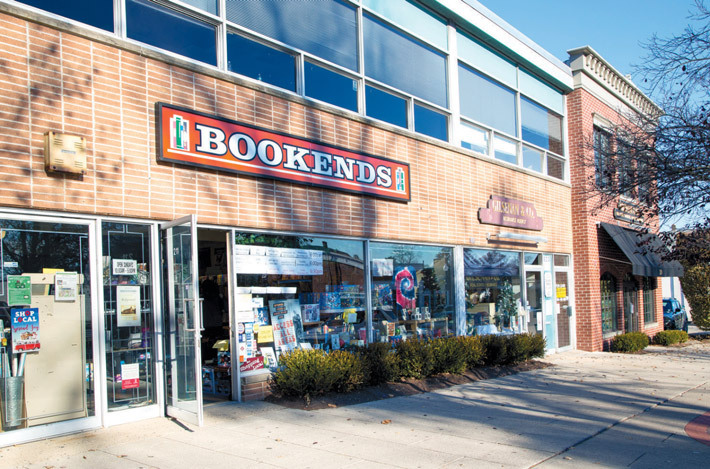 Most shops and restaurants are on East Ridgewood Avenue and its side streets, paralleled by Franklin Avenue, the connection to West Ridgewood Avenue, a smaller part of the business district. If you visit Ridgewood, note that shops are closed on Sundays because of Bergen County’s blue laws, but many restaurants are open. And it can be a challenge to find parking downtown; look for metered municipal lots off Ridgewood Avenue—or take an NJ Transit train and debark at Ridgewood’s pretty train station, which is on the National Register of Historic Places. Across the street from the train station, locals and visitors alike love the hip vibe of American Bulldog Coffee Roasters. The coffee is bold but smooth—and the matcha lattes have devoted followers. The owners roast their own coffee beans, and milk comes from a small co-op dairy farm in nearby Orange County, NY. 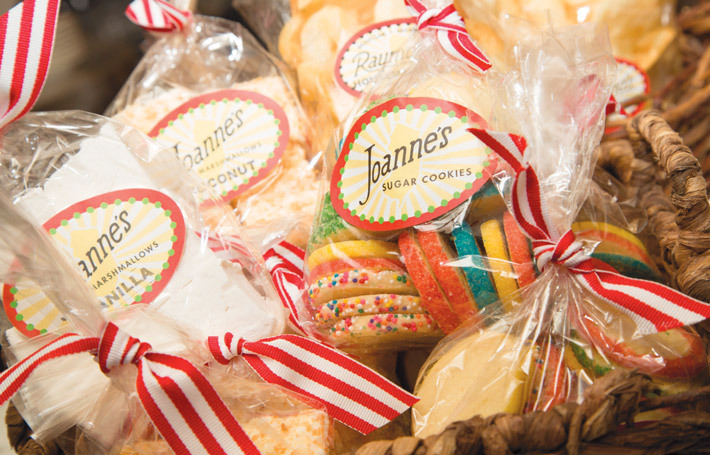 Baked goods are organic, with gluten-free options. The namesake bulldog, Delilah, is an occasional visitor. Also close to the train station is Stella Artisan, which gets raves for its Nitro Cold Brew; homemade pastries like a pancetta gorgonzola scones; and egg specialties like the “Benedetto” with prosciutto di parma, poached egg, arugula and Hollandaise atop a croissant. It may be easier to get a seat at breakfast; it’s often difficult for lunch or dinner at this trending culinary hot spot. 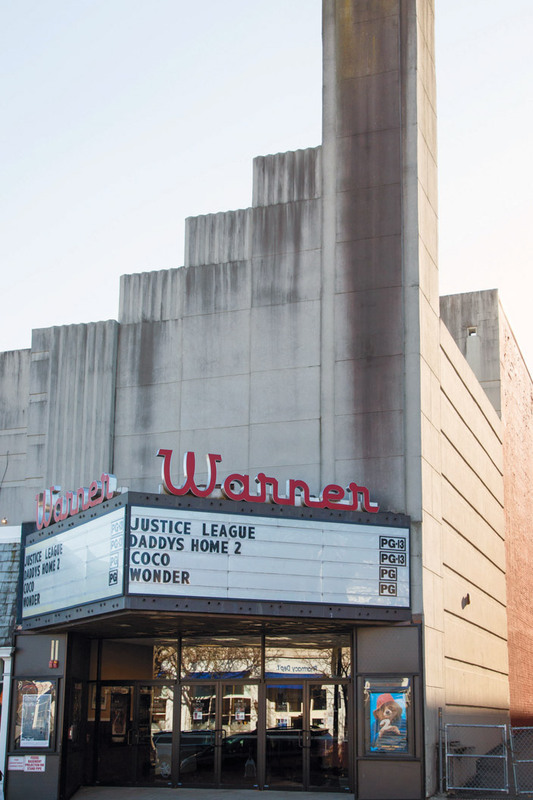 Ridgewood’s downtown has a nice mix of small shops, anchored by the art deco style of the Warner movie theater. Quality consignment shops co-exist with designer boutiques. The Hot Jewelry Box is a popular destination for inexpensive jewelry and bridal accessories, worth a visit just to take in the glittering display. At lunch, dining options abound, whether you seek a power business meal, the perfect spot for ladies who lunch or a convivial atmosphere for young children. Those in the know arrive at 11:45am to avoid the noon crush. The Daily Treat is Ridgewood’s nicer equivalent of the local diner, attracting regulars of all ages. For any meal, my favorite is the Aristocrat omelette filled with asparagus, sautéed mushrooms and creamy goat cheese. 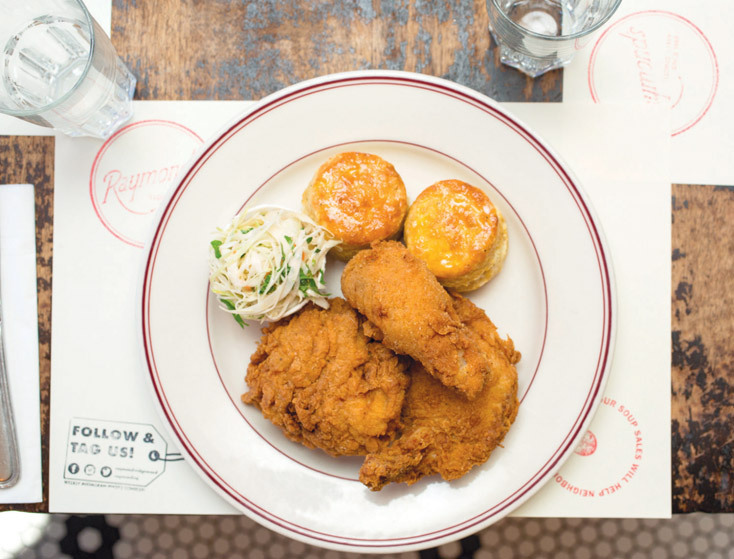 Raymond’s—an outpost of the long-standing popular Montclair eatery—has been a town favorite since it opened five years ago. It has an eclectic menu, including crazy-good macaroni and cheese topped with bacon lardons, crispy fried chicken and perhaps the tallest slice of blueberry pie I’ve ever seen. Colored seltzer bottles bathe the dining room in a rainbow glow. If you seek a quieter atmosphere, Mediterraneo is consistently voted one of the best Mediterranean restaurants in Bergen County. 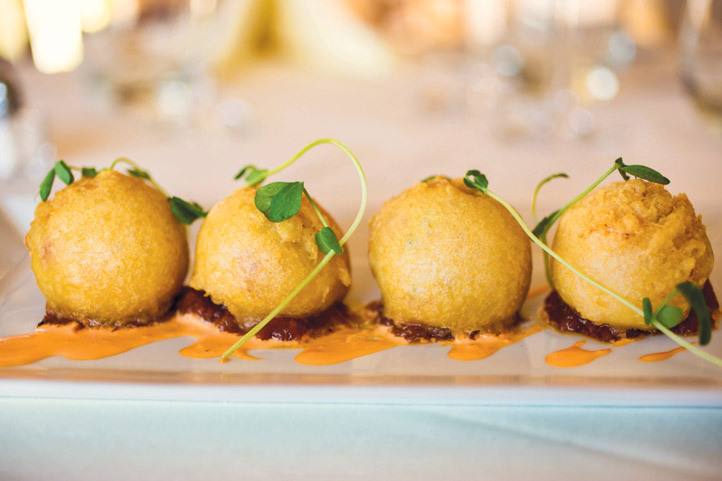 Order several small plates of tapas, or the excellent seafood and lamb entrées. Van Neste Square is an inviting space to relax with benches, green lawn, lots of flowers and brick pavers engraved with names of village families (including ours!). 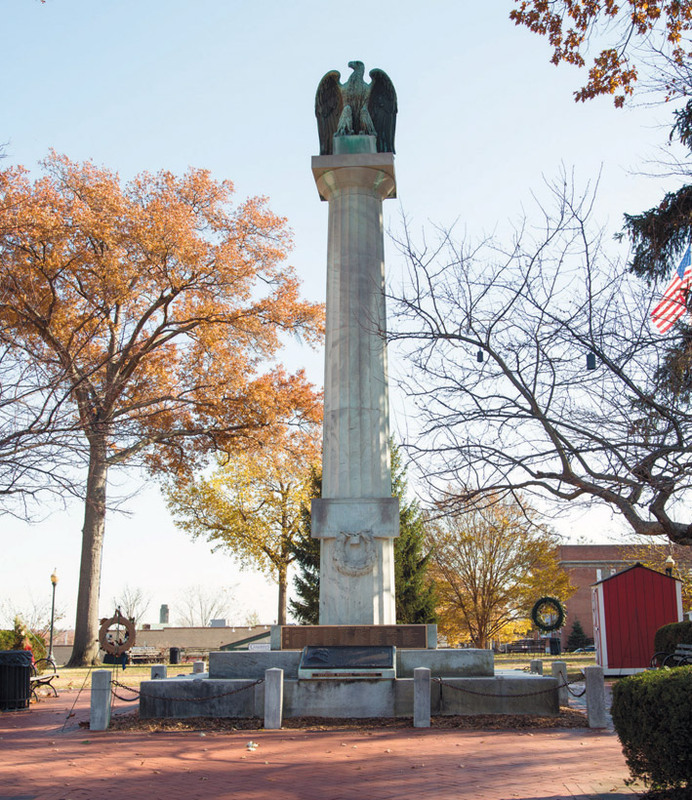 It’s a central gathering spot for local events such as crafts festivals, summer movie nights, visits with Santa Claus and the Easter Bunny and ceremonies for memorial holidays honoring veterans as well as residents who died on 9/11. If you drive to Ridgewood, turn on your Google map and head to the west side of the village to see the view from Crest Road. It’s a popular spot to take in a panoramic view of Ridgewood with New York City’s skyline in the distance. From 3pm to 5pm each day, White Maple Café has an “Afternoon Menu” that includes deviled eggs, avocado toast, and a board of whipped ricotta served with local honey, peach chutney and sourdough bread. The café focuses on seasonal ingredients that are sourced as locally and sustainably as possible, including fresh produce from Stokes Farm in nearby Old Tappan. Ridgewood also has good homemade ice cream options. On the west side is Van Dyk’s, a local institution open during the warmer months. For a sit-down frozen treat, Baumgart’s Café, a popular restaurant serving pan-Asian and American fare, also serves delectable homemade ice cream and soda fountain classics in a fun dining room decorated with framed vintage childhood games. Ridgewood has several gift shops with eye-candy displays and creative ideas for even the most challenging people on your giving lists. The Pink Bungalow offers a modern, creative twist on home and fashion accessories, jewelry, stationery and adorable baby gifts in the Bitty Bungalow. Mango Jam is a colorful home décor gift shop noted for its fabulous collection of tabletop accessories, and accent pieces that change with the seasons. B.Witching Bath Co. sells locally made artisan soaps, lotions, oils, candles and more. You might get hungry at the selections, including banana nut face scrub, golden pear body lotion, champagne- and-strawberry liquid cleanser, and more. Vape shops may be the new trend, but The Tobacco Shop of Ridgewood maintains its long-standing reputation for fine cigars stored in a state-of-the-art walk-in humidor, and fragrant tobacco blends for pipe smokers or those who roll their own cigarettes. Day passes can be purchased for the exclusive Davidoff Lounge upstairs, a high-end atmosphere for cigar connoisseurs. Time to wind down. For happy hour, the bar at Park West Tavern is the place to see and be seen. Bartenders meticulously craft cocktails and martinis, using fresh ingredients whenever possible. The Bloody Cosmo combines Grey Goose L’Orange and Cointreau with fresh-squeezed blood orange juice. 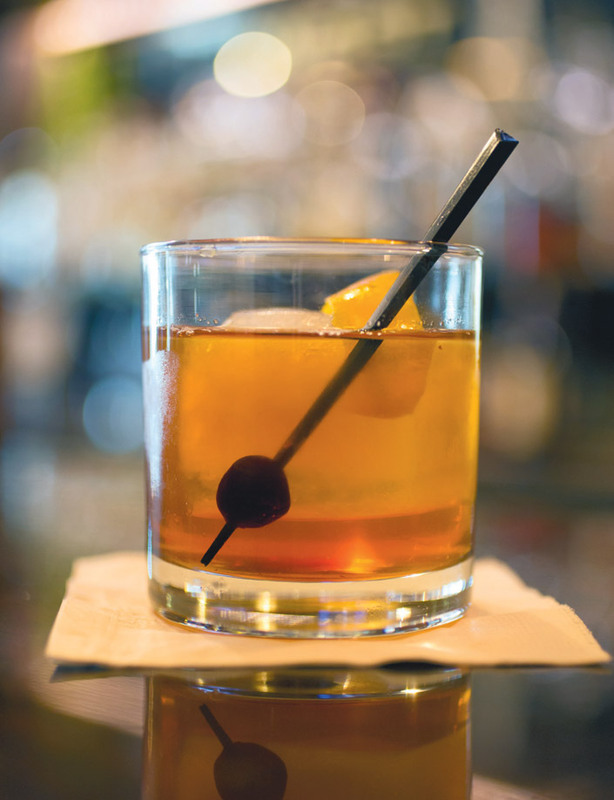 The Smokey Johnny features house apple-wood-smoked Bulleit bourbon, brown sugar, and “old time” bitters. Park West Tavern is also a hot dining spot, well known for its excellent steaks. To accompany your cocktails, get some sharing plates of finger-licking duck fat steak fries, ribeye spring rolls or juicy American Kobe beef sliders. Many restaurants in Ridgewood are BYO. 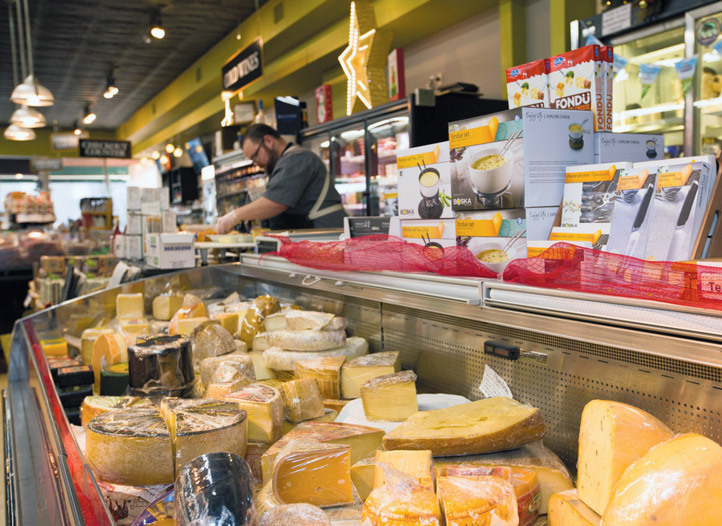 Super Cellars and Cheese Shop has one of the largest selections of wine and craft beers, and is renowned for its large section of gourmet cheeses. For dinner, I recommend an advance reservation for Village Green Restaurant, where we’ve had some of our most memorable and most creative meals. The dining room is small but charming at this BYO, located across from Van Neste Square. Chefs have changed through the years, but it still maintains its excellence. Organic heirloom and local foods from New Jersey, Pennsylvania and New York are used whenever possible, and are highlighted in the tasting menus. The team at Roots Steakhouse also places a special focus on sourcing from local growers and producers, including Goffle Road Farm in nearby Wyckoff. 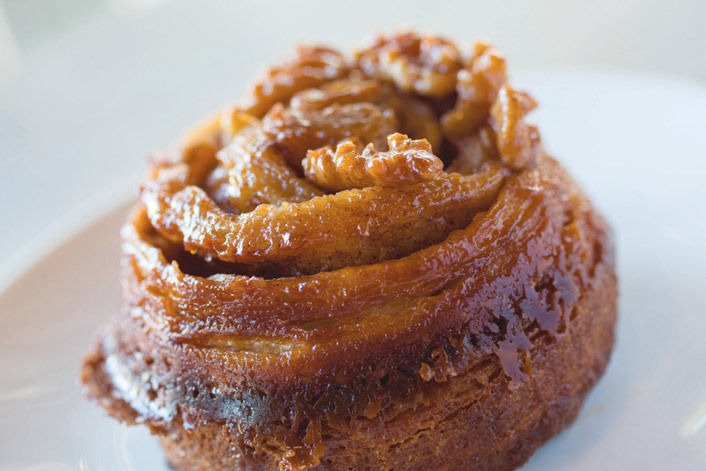 The attention to local ingredients inspires many of their side dishes and desserts as well as entrées. If you’re enjoying a burger at the spacious bar or a full-on strip steak entrée, don’t miss their house-made steak sauce as well.